The setting or circumstance doesn’t really matter. When the time comes for us to venture out into the world be it that first day of kindergarten, as a teenager, a university student, an adult to work, as I said the circumstance or timing is not the key what we do while we are out wherever we are, therein rests the focus. In the Shakespearean play Hamlet a father gives counsel to his son ranging from finances, “neither a borrower nor a lender be”, to friendship, “those friends thou hast, …grapple (hold) them to they soul with hoops of steel” to the art of conversation “give every man thy ear, but few thy voice”. These are Polonius’ words to his son Laertes as he prepares to leave for France. He shares this counsel confident, and hopeful at the same time, that he has provided Laertes with the upbringing and support that would enable him to make good choices in whatever situation he finds himself. That if he is constant to his values and upbringing he will succeed and be someone that others can count upon. In our own lives, our own self-development we would do well to reflect upon what it is we believe, really value as being at the core of who we are and then ensuring as the day follows the night that our actions align with those beliefs. I suspect it takes an element of bravery to stand for something and follow through in a constant manner. There will be times where we slip, stumble and fall in our efforts to be true to ourselves but the key rests in recognizing that the power lies within us to succeed. To get up each time we fall and carry on. The Japanese word for bravery is Yuki. It is literally the feeling of being brave. 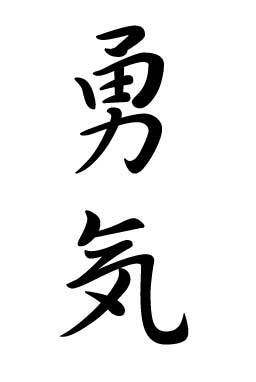 As with all Kanji it is the combination of elements, strokes, and images, that creates the meaning. In the character for brave (yu) seen to the left you have at the base the two stroke character that by itself is the Japanese word for power, chikara (seen to the right). This is not by accident, we might consider which proceeds the other, do you draw power through being brave or does it require power to be brave? I am comfortable believing it is both. To thine own self be true is not an invitation to be selfish, it’s not to go get what you feel you deserve, it’s an admonition to reflect upon your beliefs, establish what you will stand for and not fall to the everyday breezes we occasionally mistake for the gale force winds of change. I hope people who know me, know what I stand for and can count on me being true. Even the children’s cartoon Mulan get’s this with the line, “though the winds may blow yet the mountain will not bow”. Each director must make choices when bringing a play to the big screen. Watch this version of Polonius and his counsel to his son. It is Act1 Scene 3 (I’ve included the full text below) He drops a couple of key lines from the original. An example “Take each man’s censure, but reserve thy judgment” is absent nevertheless it serves as a reasonable rendition and displays the anxiety at parting that I suspect most of us feel.